Have you ever sunk your teeth into a perfectly ripe, juicy pear? Whether you’re still searching for that magical moment or know it well, come on into the Produce Department this week and next week during our fantastic sale on pears! 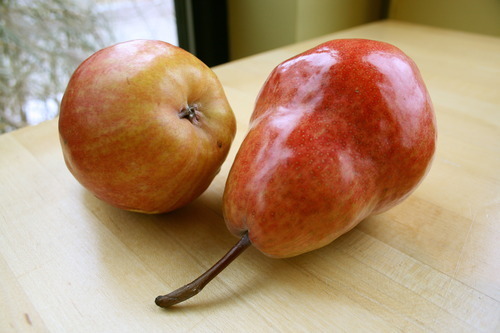 We are featuring the classic Bartlett, the sophisticated Bosc and the seductive Red D’Anjou all for just $1.79 per pound, and we’re rounding out the selection with unbelievably delicious Red Bartletts, which are soft and apple-sweet, and the jewel-like Green D’Anjous, my personal favorite for supple texture and fresh flavor. 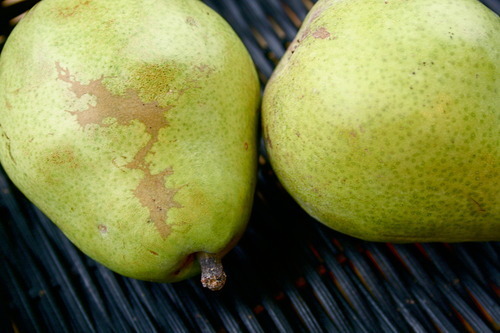 You really can’t go wrong with these pears, and they won’t get any better in quality or price! Don’t miss this chance to celebrate the perfect pear and welcome some variety into your seasonal fruit selection…which for me lately, has been apples, apples, and more apples! Wondering whether your pear is ripe? Pear’s firm flesh can make it difficult to tell, but a gentle squeeze at the neck can clue you in—if it’s soft there, the pear is ideal for eating! If all your pears are rather hard, there’s plenty of ways you can cook with them, both sweet and savory. 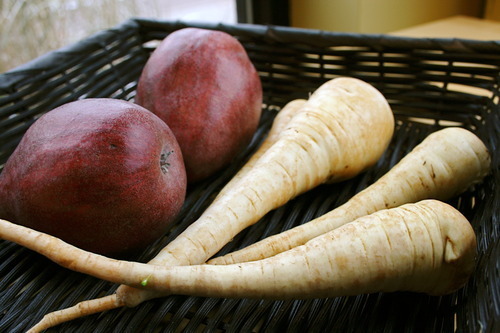 Try braising them in broth with parsnips for a truly unique side dish! A more traditional favorite of mine is the Tarte Tatin, a mouth-watering upside-down tart topped with caramelized pears, or in this recipe, apples. If you’re determined to eat your pears raw, but they’re not ripe, I have a couple of great suggestions for you! If you have a juicer, pear is the ideal addition to a green juice to take off the bitter edge. Bartletts and Boscs work great here, but any kind will do. If you’re not set up to juice, you can toss your greens and pear into a blender with a banana, almond milk, ginger, and my favorite secret ingredient—cinnamon! This light green smoothie packs a punch of nutrients. And of course, if you’re a fan of cheese (who isn’t?? ), there’s no limit to the pearings you can dream up. 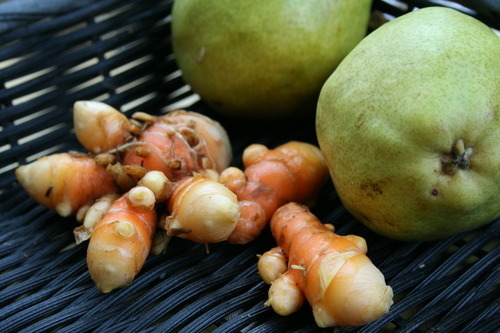 I also couldn’t resist this opportunity to feature our locally grown fresh turmeric. Coming from just across the lake in Saranac, the folks at Bucksberry Farm are also supplying our fresh ginger at the moment. If you like Indian cuisine, you already know what to do with turmeric, and if you’ve never used it, just grate it into any kind of curry or spicy dish. I add both of them to raw smoothies to maximize my joint recovery after a workout—ginger and turmeric are both anti-inflammatory, among other health benefits. Don’t miss any of these great features in the Produce department–come on in today! This entry was tagged greensmoothie, healthyliving, pear, pearfection, turmeric. Bookmark the permalink.